Dahlia writes: Starting in first grade, our son began to use words that were not part of our household such as, “I hate you” to his little sister. I started to talk to him about how powerful our words are and shared Dr. Emoto’s work in his book, The Hidden Messages in Water, where he put a word like “love” on a container of water, and it formed beautiful water crystals. Conversely, he put the word “hate” on a container of water, and it made disharmonic shapes in the water. That spring (May 2015), we cut a strawberry in half from our garden in peak ripeness. 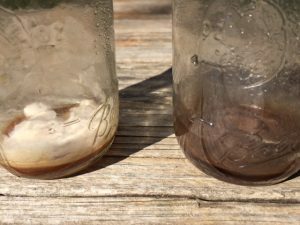 We put one half in a mason jar and wrote “I LOVE YOU” on the lid, and put the other half in another jar and wrote “I HATE YOU” on the lid. We sealed them up and spoke to them separately saying “I love you” and “I hate you,” to the respective jars. Eventually, I had them stop saying anything to the jars because our younger daughter at almost 3 then started saying “I hate you,” and I just put them up on a shelf in our bathroom out of direct sunlight. 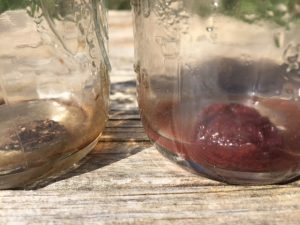 We kept checking on them and the Love one stayed juicy and red and the Hate one developed a thick white mold. Now (2 years later, this being May 2017) the strawberry half that says, “I LOVE YOU” is still plump and juicy and the one that says, “I HATE YOU” is a shriveled piece of almost nothing. The following May 2016 we repeated the experiment in case this outcome was a total fluke. 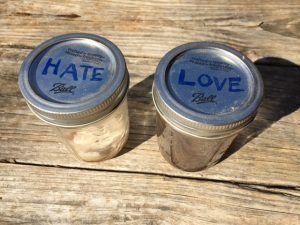 We changed it slightly by cutting a strawberry grown in our yard at peak ripeness in half and putting the halves in two jars and only wrote “LOVE” and “HATE” on the lids. The same thing happened again. A year later, the second batch of Hate strawberries is covered in a thick white mold, while the Love ones never developed mold (though they aren’t as plump as the first year’s “LOVE” strawberry). 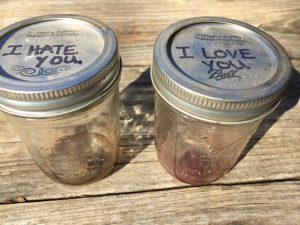 I am going to repeat this experiment again this year and use the same method as the first year using only one strawberry cut in half and writing “I love you” and “I hate you” on the jars to keep it consistent with the original experiment. This was a powerful experiment that resulted in our son not using the Hate word in our house as often as he had. It still slips out when he is really mad, and I remind him how powerful our words are, especially when directing that energy toward another human being. We can’t see the effects on the inside of someone, but the strawberries helped him see the long-range effects outwardly. As our son grows older, he is beginning to value the kind and respectful language we’ve intentionally made a rhythm in our home. Even simple exchanges such as, “Please,” ”Thank you,” and “You’re welcome,” are part of a rhythm that supports our home life. Inspired by Dr. Emotos work, I have incorporated a simple water rhythm into our family life since our first child was born. We say, “1, 2, 3, thank you water; uno, dos, tres, gracias agua,” when turning off the water after a shower or bath. This helped me to remember to give thanks every time I used water and to help signal to the children that the water was going to be turned off. Even when the children didn’t want to get out of the shower, when I would start to say, “1, 2, 3” they would turn off the water every time and thank the water. It was amazing to see how a simple, consistent statement could be so powerful and help incorporate gratitude and reverence into our daily life. Dahlia Moon is a mother of three, living in the mountains of North Carolina; she is a recent graduate of LifeWays. In her life, she blends her experience of child birth and child rearing with her work as a birth attendant and massage therapist, as well as an art teacher. Adaptive and curious, she is knowledgeable and has trained in many other modalities as well, such as movement therapy, healing and culinary art which she brings into the different aspects of her work. She is striving to offer to others a possibility of finding and supporting their own natural way to be a creative parent.